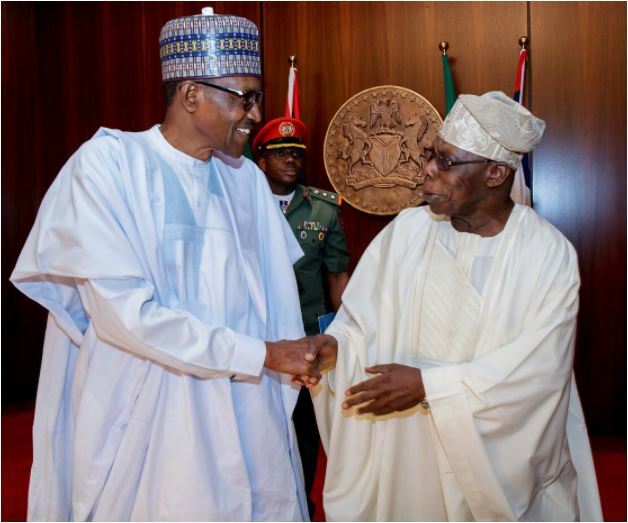 President Muhammadu Buhari has reacted to Olusegun Obasanjo’s endorsement of presidential candidate of the Peoples Democratic Party, PDP, Atiku Abubakar. Obasanjo had in a meeting held with Atiku and some PDP leaders endorsed his presidential ambition. He declared that Atiku will defeat the incumbent President, Muhammadu Buhari of the All Progressives Congress (APC) in 2019. However, Buhari in a statement by his spokesperson, Garba Shehu, on Thursday described the meeting as a ‘well rehearsed theatre’, adding that both leaders will fail in 2019. Read the statement below: “The Presidency has received the news of former President Olusegun Obasanjo’s predictable U-turn and somersault on the endorsement of the PDP candidate, Atiku Abubakar, at a meeting Thursday, and to say that we are the least surprised by the well-rehearsed theatre. “They will lose together. Listening to the prepared statement of the former President after the meeting showed the usual ego trip and “I know it all” character of Chief Obasanjo. “It also betrayed a lack of understanding of today’s politics which is about good governance.The country voted for change in 2015 and a leader that ensures good governance which only President Buhari and the APC can provide.Bent on these laudable goals, we will not allow ourselves to be distracted. “Many governments have come and gone, but they did not care about some of these projects. We were talking about these things for sixteen years under the PDP and nothing was done. Nigerians trust President Buhari in this effort because they are convinced he is not in government for personal financial benefits, or for an ego trip.